Classic tower defense game releases soon for the Vita. Read inside! 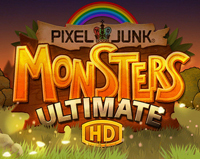 PixelJunk Monsters: Ultimate HD releases on PSN July 30th for North America, and will cost $14.99. Europe can buy it on July 31st, as will the majority of Asia with a Japanese release date to be announced soon. Tailored for the PS Vita in crisp HD, the super collection of tower defense classics will be a treat for tower defense fans. Follow the creators on Twitter, @PJMonsters, for some cool giveaways soon. Are you a fan of tower defense games? Are you going to pick this up? Comment below.